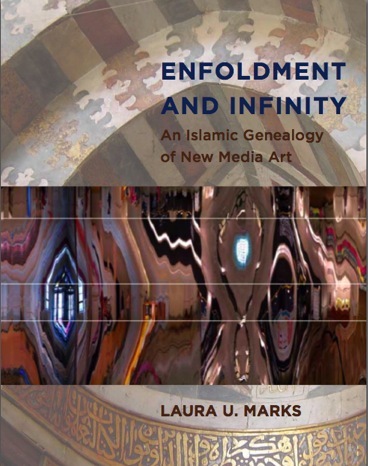 Enfoldment and Infinity establishes points of contact between classical Islamic art and contemporary computer-based art. For example, both are often aniconic, both are performative, both unfold from an invisible source. Demonstrating and inventing Islamic “roots” for new media art, the book argues that specific moments of classical Islamic thought give us new and fruitful ways to think about contemporary art. The book also traces what I call “the haptic transfer and the travels of the abstract line”: how Islamic aesthetics journeyed westward from medieval times on, drawing out powers of abstraction and embodiment, ultimately to inform modernism and contemporary new media art. It demonstrates meeting points between Islamic thought and the philosophy of Gilles Deleuze, and it proposes an enfolding-unfolding aesthetics to explain how artworks (and other things) unfold from the universe through a filter of information. The books is richly illustrated with 141 b/w illustrations and 31 color plates. Josh Ellenbogen, “Value: Erkki Huhtamo, Illusions in Motion: Media Archaeology of the Moving Panorama and Related Spectacles; Laura U. Marks, Enfoldment and Infinity: An Islamic Genealogy of New Media Art,” The Art Bulletin, 96:1 (2014): 132-134. Carol Bier, review in Journal of Mathematics and the Arts 6:2-3 (June-September 2012):137-139. Marina Warner, review in Art Newspaper 230 (December 2011): 46. Kathleen Scott, review in Screen 52:4 (Winter 2011): 553-556. Jay Murphy, “Unfolding Complexity,” Afterimage 38:6 (February 2011): 38. Nora Azouz, “L’Islam dans les arts expérimentaux,” L’Express du Pacifique (January 28, 2011): 11.